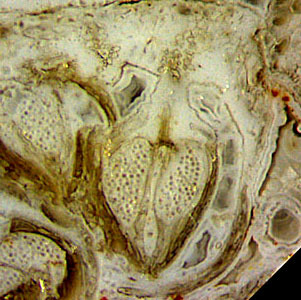 Why a Permian tree fern had got the name "maggot fern", which is Scolecopteris in Latin, can easily be guessed from the two pictures below, taken from either half of a cut chert boulder collected at the type locality of this fern in 1997. A few samples found before 1800 had aroused the imagination then, and given rise to interpretations as creatures, until the fossil had been recognized in 1802 as a plant and described as Scolecopteris elegans in 1837 . This fossil had considerably contributed to the development of palaeobotany as a science, hence it is worth looking at in detail. Later it became obvious that the foliage belongs to the beautiful silicified Psaronius tree trunks. Figs.1,2: Maggot fern (Scolecopteris) pinnules in various states of preservation, more or less deformed, suggesting interpretations as grubs or nymphs of some insect. Images (widths 7mm and 8.5mm, same scale) taken from the cut halves of one chert layer fragment. Apparently some of the capsules in Fig.1 had not been fully grown before frond parts fell down into the water, accumulated there, became deformed, and silicified. 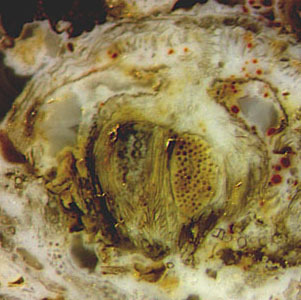 Note the red and yellow stains of spores in their mature capsules in Fig.2. Problematic is another chert sample from the same location with distinctly seen pinnules on the surface (Figs.3,4). Plant parts on chert layer surfaces are clearly seen if they are preserved as hard chert after the adjoining matter had been eroded away or spalled off. 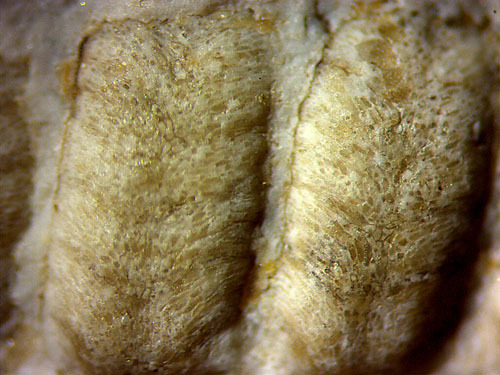 Fig.3 (near left): Maggot fern pinna on the raw surface of a chert sample, pinnules apparently not deformed. Angle of veins about 60°. Same pinna as in , Fig.8, and , Fig.210A. Image width 11mm. Fig.4 (far left): Pinnules from Fig.3, upper row; epidermis texture following the veins towards the margin. Image width 3.5mm. The pinnules touch laterally in the depth, which is not seen here since the gaps are filled with whitish chalzedony. Apparently the fill had been left over when a crack propagated along the cuticle on the epidermis, jumped from one pinnule to the next, thus separating the whitish layer and laying bare the pinna as we see it now. The waxy cuticle, if still present after silicification, provides a potential crack path for easy propagation. This fern has been interpreted as Scolecopteris elegans in [2,3] but recent finds of big synangium stalks have given rise to doubts (Figs.5-7). For comparison see the drawing after the lectotype of Scolecopteris elegans in , Table 1, showing a pinnule with very short synangium stalks (Fig.8). In the same publication , pinnules with big synangium stalks (Fig.9) had also been assigned to Scolecopteris elegans, which is highly questionable. A surprising answer concerning big stalks is suggested by Figs.5-7 instead. Note that the stalk may be not well seen or not seen at all since the synangium axis most likely does not lie in the arbitrarily chosen cut plane. It seems to be slightly tilted to the cut plane in Fig.7 so that the stalk appears narrower than those in Fig.6, where their width is 0.27mm. More synangia with big stalks had been found earlier in a few more chert samples from this location, which indicates the presence of other species. Fig.8 (below left): Pinnule cross-section drawn after the lectotype of Scolecopteris elegans as defined in , width 2mm. Fig.9 (below right): Pinnule cross-sections with big synangium stalks drawn after , Table 5, coll. Etzold about 1890. Despite of these obvious differences and other features indicating the presence of other species, M. Barthel had stated in , p.75, that most probably there is only one maggot fern species at the type locality of Sc. elegans. According to , p.226, he sees more species there now. However, referring to the sample Bu8/18 considered here, with the same cut faces, he claims that the fern is certainly Sc. elegans. Since the synangia in Figs.5-7 are rather similar to those in Fig.9 but differ much from the lectotype in Fig.8, most likely they represent a different species. If it were a known species of Scolecopteris, it should fit into one of the four groups proposed by Millay  but it does not seem to fit well into any. The apically thick sporangium wall would favour putting it together with Sc. elegans into the "Minor group" but this is precluded by the big pedicel shaped as a "broad cap of parenchyma uniting the sporangia to each other and to the pinnule" [5,6]. This describes the pedicel of Sturiella there but also fits surprisingly well to what is seen here in Figs.5-7. Apparently M. Barthel did not notice these well visible synangia with big stalks, which had been available to him on the cut sample faces. Also he did not notice that a less well preserved synangium in his Fig.210B in  seems to be of the same type as these ones. Hence, it is all Sc. elegans to him, and he offers an extended description, allegedly of Sc. elegans, based on three samples including Bu8/18 which probably contains Sturiella only. Such description, which probably is based on an error, is probably not valid. Evidence from Figs.5-7 indicates that Figs.6-8 in  and Figs.210A-G in  are not "certainly Sc. elegans" but possibly Sturiella intermedia. This would be compatible with earlier own finds of synangia with big pedicels and of sporangia with hairs. In connection with Sturiella one need not avoid the familiar name "maggot fern" since Sturiella intermedia (Millay 1997) is also known as Scolecopteris intermedia (Lesnikowska, Galtier 1991). It may be mentioned here that  and  are fraught with numerous inaccurate or erroneous size data and other errors which may cause irritation. Example: Sc. elegans spore sizes are 40µm on p.228, 70µm in Fig.209, but 27µm in reality. See Google: errors palaeobotany. There are contradictory size data on Sturiella in [5,6]. Samples: Found by Uwe Wagner (Dresden) in 1997 at the type location of Sc. elegans and kept in his collection under the labels Bu8/23 (here Figs.1,2) and Bu8/18 (here Figs.3-7). 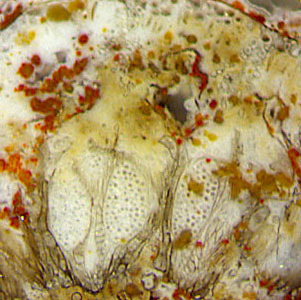 E. Zenker: Scolecopteris elegans, ein neues fossiles Farrngewächs mit Fructification. Linnaea 11(1837), 509-12. 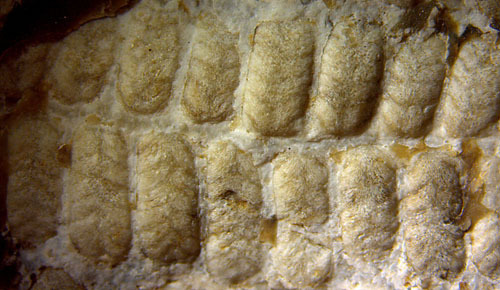 M. Barthel: The maggot stones from Windberg ridge. in: U. Dernbach, W.D. 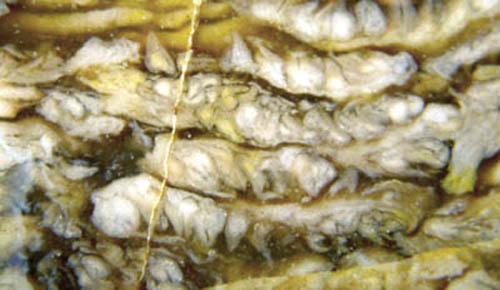 Tidwell: Secrets of Petrified Plants, D'ORO Publ., 2002. p. 65-77. M. Barthel: Die Rotliegend-Flora der Döhlen-Formation. Geologica Saxonica 61(2), 2015, 108-229. M. Barthel, W. Reichel, H.-J. Weiss: "Madensteine" in Sachsen. Abhandl. Staatl. Mus. Mineral. Geol. Dresden 41(1995), 117-135, Table 1. M.A. Millay: A review of permineralized Euramerican Carboniferous tree ferns. Rev. Pal. Pal. 95(1997), 191-209. 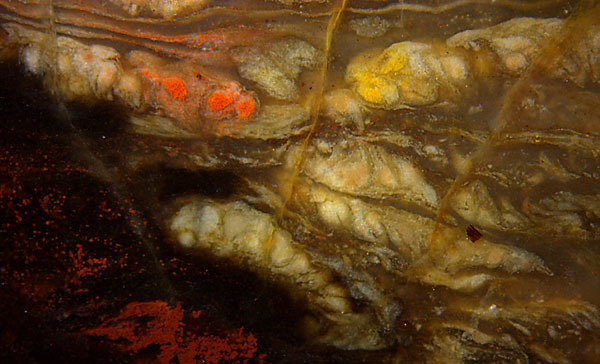 A. Lesnikowska, J. Galtier: A reconsideration of four genera of permineralized Marattiales ... Rev. Pal. Pal. 67(1991), 141-152.